How are you doing this winter? Are you keeping warm? I have avoided touching the thermostat so far this winter, but we are bundled up from head to toe these days. Right now it is 3:30 in the afternoon and it is 65° inside my house. That is almost 55° cooler than that it gets in the summertime here in Arizona, so don’t tell me I am a wuss haha. It is nice to have a break from running the artificial air machine (A/C) in the house 24/7, but don’t tell my husband that. That’s his business (: While winter is pretty mild here compared to other places, there are a few things that I enjoy, and some not so much. 1. The opportunity to bake! 2. Fire! Campfires, Wood stove fires, Oven fires…Oh wait I said that already. There is something about a crackling fire that brings me back to my grandparents’ hearth. They had a brick fireplace that my grandpa took pride in keeping stunningly ablaze. After greeting us from our drive, I would climb the orange tree in front of their house and grab one of the best navel oranges ever grown by man. Running inside the house and out of the cold, I would sit on the brick hearth and feel the roaring heat on my back, and also feel the loving gaze of my grandpa and grandma. From that vantage point, I had warmth on both sides, and sitting around a fire warms my heart in just the same way. Whether its my sheepskin boots that make my toes happy, or my knee high boots that make me feel like Nancy Sinatra, there is something about boots that make flip flops a long gone thought. From the smell of petrichor, to the imprint of raindrops in the desert sand, there is something about a recent rain that beckons one to take a drive in the country. Recently this calling was heard by my husband and daughter. They took a dirt road that we have taken many times before. It is a scenic shortcut to our house that is well traveled. The bummer part is that a sharp rock shaped like a spear tip (which would normally be covered in dirt) went right through the treads of our back left tire. Thankfully, the tire kit in the Jeep was easy to use, the spare went on, and they both made it home safe. While driving through puddles used to be one my favorite things to do in the truck, these days with a toddler in the backseat, driving through rain is not my favorite thing to do. BUT…One of the simplest (and cheapest) things that I have found that makes the most noticeable difference to my vehicle is new windshield wiper blades. Why sludge through the rain with streaks and no visibility when you can buy a pair of wiper blades for 8 bucks! Last but not least, what I dislike about winter is the necessity to bring the Christmas decorations down. With the lights and garlands and ornaments up, the house looks like a perpetual party. The house is scented with spice and pine, and there are joyous carols being played on every station. After new years eve, the inevitable need to cut the party out the animal and to get back to business occurs alongside the removal of all things festive. While I know there is a time for everything, when the walls are barren of seasonal decor I can’t help but feel a little remorseful. When the special ornaments are put away, the stockings are folded, and the tree has been removed from its stand, it is with a feeling of wistful accomplishment of another year passed and a feeling of hope and optimism for the new year. This bread is rich and full of tropical flavor. The glaze is absorbed into the bread and seals the deal on a quick bread that is so moist, it could almost be confused for a pound cake! Preheat oven to 350°. Prepare one 9"x5"x3" loaf pan, or two mini-loaf pans with cooking spray. Whisk eggs in a medium bowl, then add the butter and sugar and stir until smooth. Then add the pineapple, orange juice and vanilla and combine thoroughly. Sift the flour, baking powder, baking soda and salt into another bowl, and then combine with the liquid ingredients. Optional: add 1/2 cup of nuts at this time. Bake in the oven for approximately 40 minutes for the mini-loaves, and 1 hour for the regular loaf pan. Once the loaves are removed from the oven, dissolve sugar in the orange juice in a saucepan over low heat just until it begins to simmer. Spoon over the hot loaf and let sit for at least 10 minutes before removing to cool on a rack. Store in the refrigerator wrapped tightly with plastic wrap. 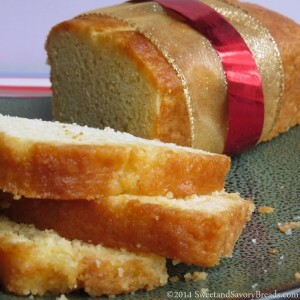 Posted in Breakfast Breads, Quickbreads, Sweet Loaves for GiftingTagged food giftsBookmark the permalink.